Simmtronics Semiconductors ltd, an Indian tablet manufacturer after launching number of Tablets in the market like XPAD X722 and various other has came up once again with the new product but this time it has came with the Gaming Tablet which is especially designed for playing the games on the device, and it is expected to be first of its kind in the Indian Market. 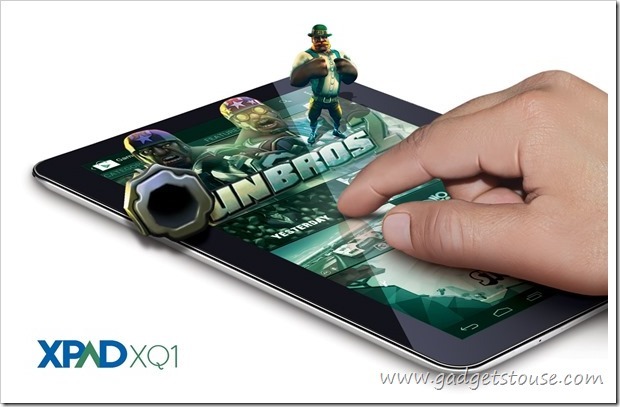 Along with games the XPAD XQ1 lets its users to play four videos at the same time to the user. There was a strong buzz about something that lets the users to enjoy the game and we can state that Simmtronics had came up with India’s first Gaming Tablet device. It is expected to compete with the high end Tablets from the Samsung Tab 2 and various other tabs that are available. And can bank by stating it as the fully Gaming centered tab. Also it comes with the high end processor and the newer version of the famous operating system. Now let us see the specifications and features that are offered by the XPAD XQ1 to the customers. Also the XPAD XQ1 is available through most of the leading E-Commerce sites. The Simmtronics XQ1 comes with the Dual camera options, that is a great thing for the device in the Tablet category. XPAD XQ1 comes with the 2 MP of primary camera at the rear side, which is a decent one for a tablet though somewhat higher camera, also on the front side it has the 0.3 MP of VGA camera that lets the user to do the Video Calling which is the common functions nowadays. On the Memory side XPAD XQ1 boosts the 16 GB of internal storage memory, so it lets the users to store more numbers of games and the movies in the device. Also it comes with the 32 GB of expandable memory via the Micro SD card. This lets the customers to expand there storage capacity and will never run short of the memory. The XPAD XQ1 comes with the 1.0 GHz Quad Core ARM Cortex A7 Processor, with Boxchip A31 chipset board that lets the device to pump up the greater processing speed in to the device and as we know that this is the Specialized Gaming Tablet so a powerful processor is must, as without the proper processor the larger games tends to be lagging . For greater Graphical experiences the XQ1 comes with certain add ons for the processor like 4X IMG SGX544 MP2 OpenGL ES2.0 Open CL1.x, DX9-3 Graphics that maximizes the User Experience. So this seems to be a good effort by the Simmtronics as it has included the powerful ARM processor. XQ1 comes with the 2 GB DDR3 RAM which is an splendid performing hardware and is usually used for the greater Graphical performances and lets the HD games and videos to perform smoothly. XPAD XQ1 comes with the larger battery of about 6000 mAh, which was expected as it have to support the device that is specially designed for playing the games and watching movies. The battery seems to be a good one and can give a backup of about 6-7 hours after a single charge for an heavy user. Also it has the 100 hours of the Standby time. 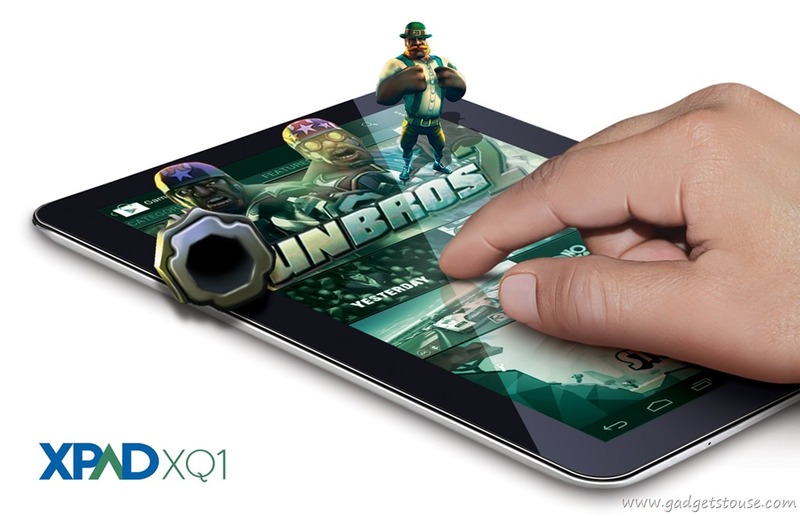 The Display of the XPAD XQ1 is one of the most important feature in this Tablet, as it is an Gaming tablet. XQ1 comes with the 10.1-inch Ultra-sharp IPS Retina screen, with the screen resolution of about 1280 x 800 pixels. This is good display and is specially designed for the gaming devices. Also the screen has the 10 point multi touch feature with the automatic four direction display that makes the tablet an easy device for controlling and also lets the user to play the game smoothly. XPAD XQ1 comes with the famous Android v4.1 Jelly Bean operating system, which is the default operating system for most of the Tablets that are launched in the market. Also it adds the new feature to the Tablets and also can be upgraded to the newer apps and operations. XPAD XQ1 offers various connectivity options such as the Bluetooth, Wi-Fi and 3G. XQ1 supports 3G via the dongle, it also lets the users to browse the internet with the greater speed. Also XQ1 through HDMI support the users can share the photos, videos and other things on a TV monitor or Computer screen. Also it has the 3.5 mm jack for Stereo earphone jack. The device will let users to use multiple gaming and entertainment applications like Need for Speed Most Wanted, Modern Combat 4, Big Fish Games, Google Play and the huge variety of other games. XPAD XQ1 is all set to compete with the high end devices like the Samsung Tab 2 and also with other Tablet that are present in the market. But as of now there is no direct competitor to the XPAD XQ1 from the Indian Manufacturers, but it have to face challenge from the International Vendors like the Samsung, Apple and other that have strong presence in the Tablet market. On the whole the XPAD XQ1 is great device that is offered by the Simmtronics, XQ1 boosts Quad Core Processor, greater storage options, dual cameras, and also it has the DDR3 RAM. All and all how the customers react to the XQ1 will be important to see. But at present the device seems to be a good option for the Gaming lover customers. XQ1 is available with the price tag of Rs.15,999 that seems to be an competitive one, though was expected to be on the cheaper side. thanks for writing such a nice review along with comparison.